SAP & Qualtrics: Will it transform the way we think about CRM as we know it? Around 77 percent of all transactions worldwide touch an SAP system. Hence, it is fair to conclude that the SAP systems own the operational data. That does not only apply in the field of customer engagement, but also in the domain of financial transactions and reports, supply chains, human resources, etcetera. SAP nowadays belongs to a main asset of large scale organizations. Now, all these data can tell us exactly what is happening, and even how it takes place. For instance, by means of analytical solutions or CRM systems, we are able to determine annual turnovers in seconds, predict consumer trends over time or even draw patterns in buying behavior. However, the ‘why’-question has remained unknown, which would allow us to get human sentiment in the moment. Hi Qualtrics! who are you? Recently, SAP acquired Qualtrics, a technology platform that organizations use to collect, manage, and act on experience data (X-data). It makes sophisticated research simple and empowers users to capture customer, product, brand -and employee experience insights in one central place. This experience management (XM) platform can tell us why certain events have occurred. XM focuses on obtaining and tapping the value of outside-in customer, employee, product and brand feedback. Combining Qualtrics’ experience data and insights with SAP’s unparalleled operational data will enable customers to better manage supply chains, networks, employees and core processes. Together, SAP and Qualtrics will deliver a unique end-to-end experience and operational management system to power organizations, by combining O-data with X-data. What is included in Experience Management? 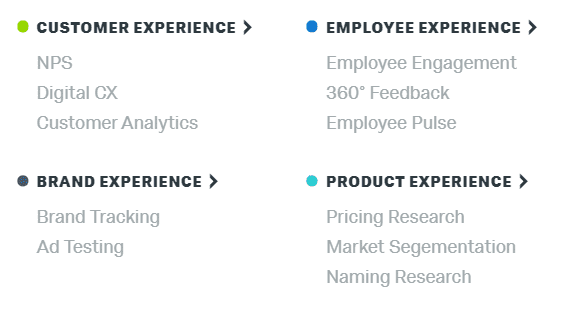 Qualtrics has defined 4 main categories measuring experience, as mentioned before: customer, product, brand -and employee experience. Ryan Smith, CEO of Qualtrics, said: “Our mission is to help organizations deliver the experiences that turn their customers into fanatics, employees into ambassadors, products into obsessions and brands into religions. Now, multiple categories of experience management including several metrics are available to track brand value, NPS or employee engagement. What is more, each individual metric can be fully customized to exactly measure the desired states. For example, zooming in on NPS, a well-known metric with loyalty purposes, users can easily uncover customer loyalty drivers, segment customer by these drivers and thereby identifying unsatisfied and at-risk customers. While tracking consumer data, experience improvements can be monitored across the entire customer journey. So, if you embed this tracking services throughout your organization, insights on all touchpoints with a customer are obtained, which even allows you to start predicting what customers will do next! I am a customer. What is in it for me? 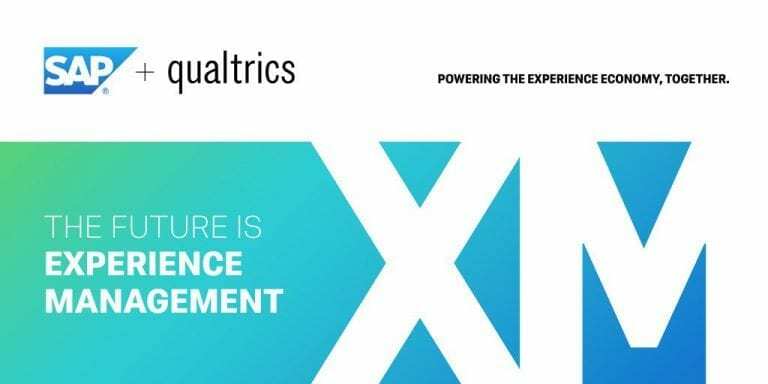 Yet, Qualtrics offers a wide range of experience management metrics to gain in-depth customer, product, brand -and employee insight. Since SAP recently acquired Qualtrics, the question is how this solution will integrate with the SAP portfolio. Considering the CX (Customer Experience) portfolio of SAP in particular, which still is the main aim of Acorel, we now explore how Qualtrics can further strengthen our proposition. In fact, Qualtrics has not been acquired as an extension on customer experience, but on the whole SAP portfolio. For instance, one can imagine that employee experience of Qualtrics must add value to SAP SuccessFactors HRM. It is only a couple of weeks ago since SAP acquired Qualtrics. Right now, SAP is working on a scenario where Qualtrics is integrated with several SAP solutions. So far, it is unknown to which touchpoints of our solutions Qualtrics can have its influence, not to mention how it will be technically integrated and how it looks like in an IT architecture. While SAP’s intention is to leave Qualtrics as standalone within the company for now, external experts argue this need to wider data integration means Qualtrics will have be integrated into other SAP products as well as extended beyond its traditional remit. It must be mentioned that the timelines are unclear so far. The reason I wrote this blog about Qualtrics, is because of my experience in the field of marketing research and my current role as a business development manager at Acorel. Today, over 8.000 organizations worldwide use Qualtrics, including 99 of the top 100 business schools. That is also how I was supposed to Qualtrics. I was a student at Tilburg University, doing research in the field of Marketing Management, and the absolute tool to be used was Qualtrics. That means the next generation is being trained on Qualtrics right now. I am very positive towards this acquisition of SAP, since I recognize the added value of this solution to the customer experience proposition of Acorel. Although the integration and timing are still unknown, I am gleesome to dig deeper into this tool and uncover how this can help our customers to become more successful. Finally, I must add that I value the strategy and vision of Qualtrics as told by Luke Williams (Head of CX Strategy & Thought Leadership) on 28th of November 2018 (Rotterdam). Please, feel free to contact me for remarks or questions!